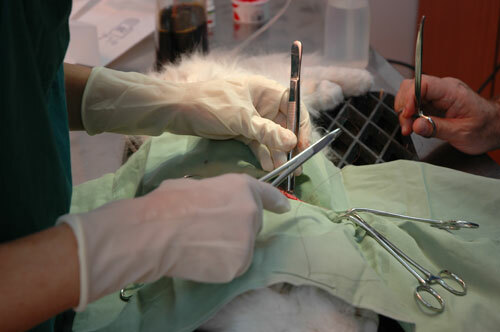 A general anesthetic results in a loss of consciousness in the animal and a loss of sensation throughout the body. Most general anesthetic procedures involve several steps beginning with the administration of a sedative. An intravenous injection of an anesthetic renders the animal unconscious while a breathing tube is placed into the animal’s trachea. A gas anesthetic is delivered in combination with oxygen to the animal via the breathing tube to maintain the state of unconsciousness.Although general anesthetics are significantly safer than they have been in the past, there is still the remote chance of an anesthetic accident. There are many ways to reduce the risk associated with anesthesia including a physical examination and blood work prior to anesthesia. Anesthetic monitoring equipment and protocol can also contribute to a safer anesthesia.